Hello, hello! I’m thrilled to be back and share more rental friendly decorating tips and DIYs. 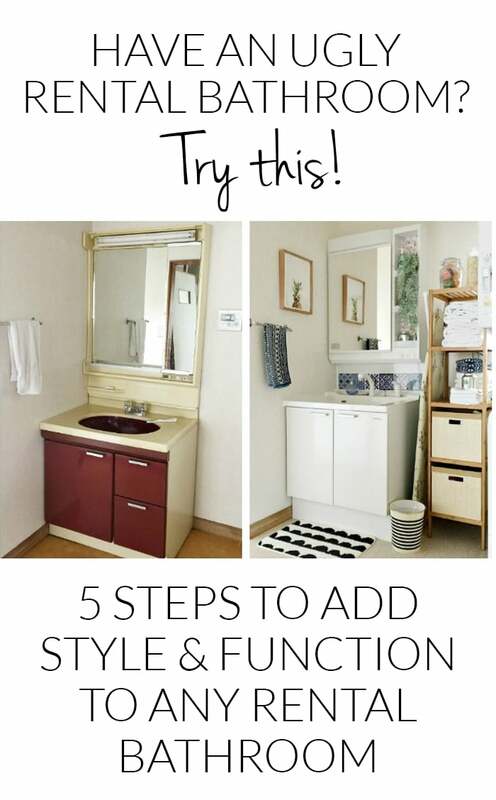 Today I’m sharing tips for adding personality to a rental bathroom. Kitchens and baths can be the hardest to evolve into your preferred style because of their permanent finishes but if you try these decorating tips you’ll have a chic bathroom to show off in no time! First, if your bathroom is really outdated or there is damage, it doesn’t hurt to ask your landlord for an upgrade. You might be surprised at the answer! Our current rental had an awful red bathroom vanity with rotting wood shelves inside, holes, rust, and a missing light cover. I asked the owner to replace it and he did. Plus he updated our floors. It never hurts to ask! Hang paintings, prints, candle sconces, or baskets on the walls. Bonus, a hanging basket or bin can provide more storage! 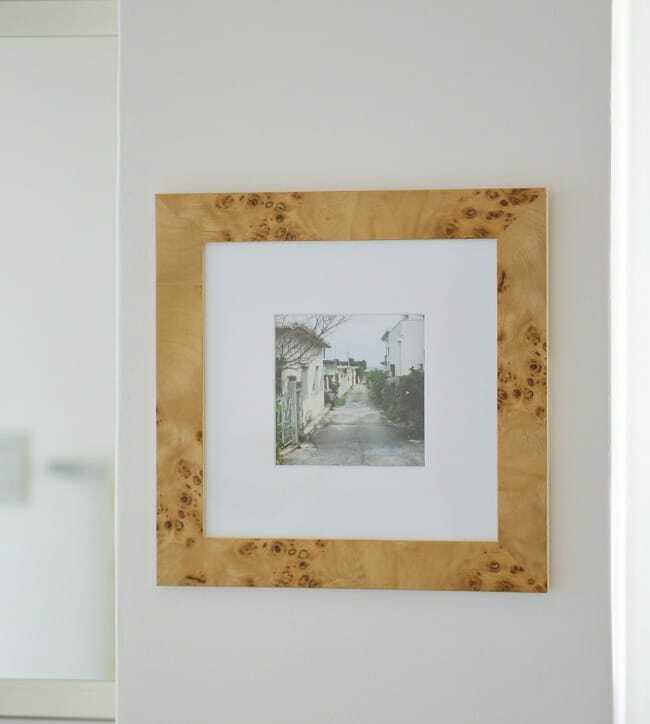 If your bathroom is well ventilated you can hang oil, water color, acrylic, photographs, and other prints. If you are worried about protecting your art, a global candle sconce or a fresh modern printable or picture will add a special touch. Use command strips to keep the wall hole free. You can also use velcro strips for hanging items on a tile wall. Use open shelves for extra wall storage or a free standing shelf. Hide cleaning supplies and toiletries in baskets. I love using woven texture with bamboo or teak wood in our rental bathrooms and they are great for hiding exposed cords or hoses. Place additional furniture in your bathroom for extra storage or seating. 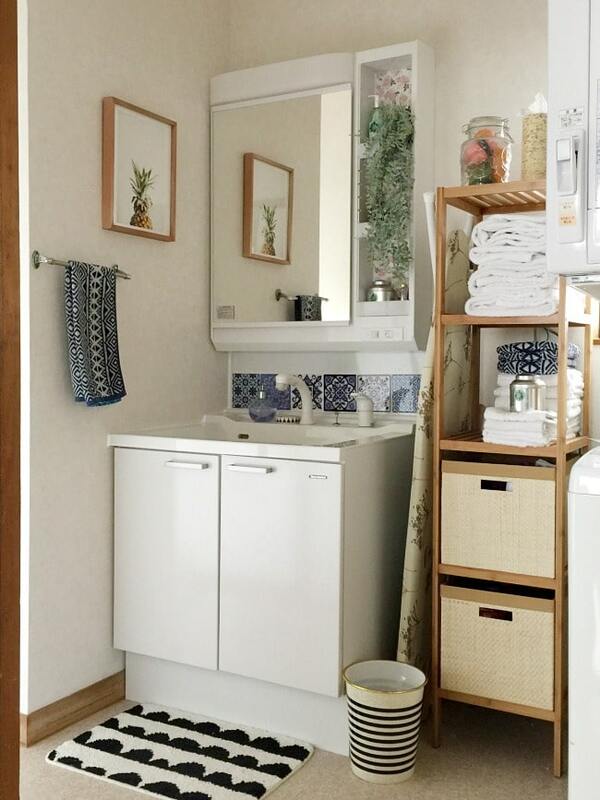 If you have the space, a small dresser or chest can house bathroom necessities. Warm wood tones are often a fantastic compliment to cold bare surfaces in the bathroom. 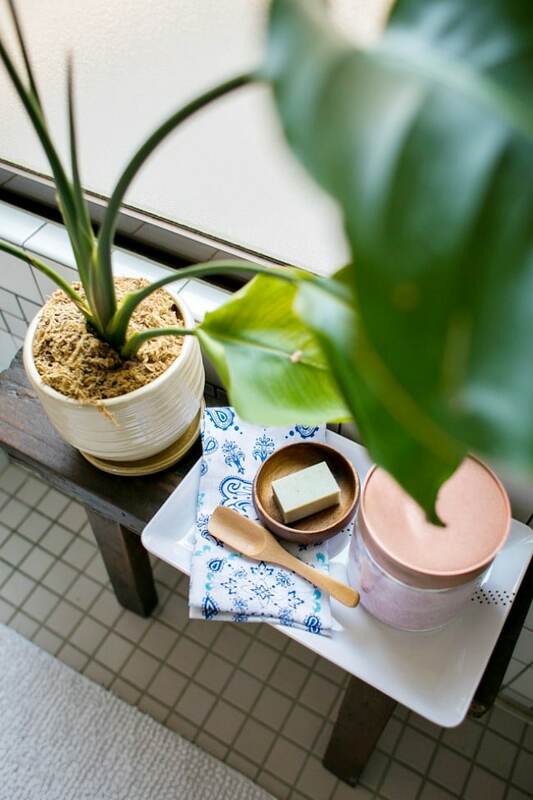 Just using a little bench with a few bath accessories can turn your rental bath into spa ready! 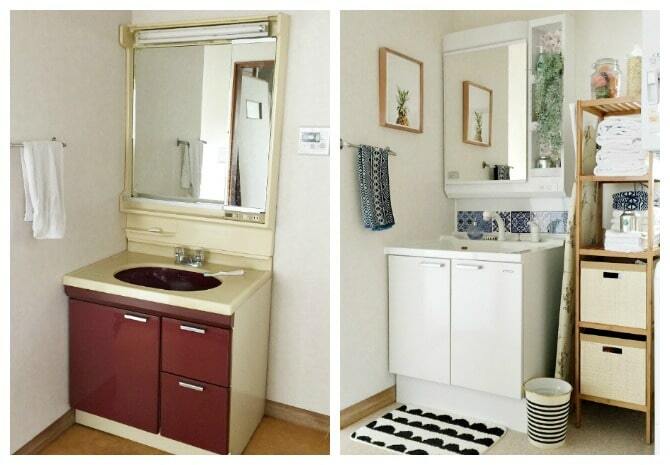 Hide unappealing areas with decor practical for the bathroom. We always seem to end up with weird wall units or unsightly open storage pieces in our rentals. Instead of fighting it, decorate to it. 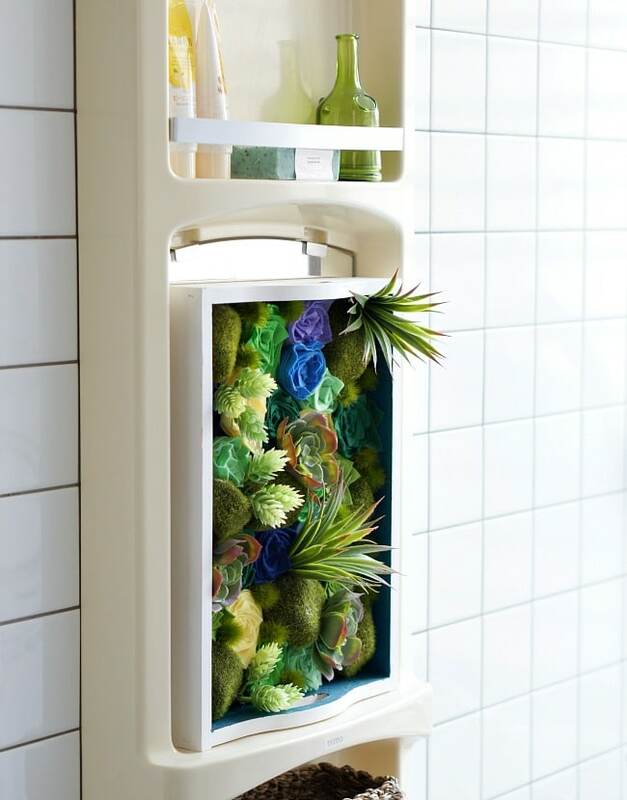 Fill odd spaces with plants (faux or real), pretty soaps in containers, bath salts, a pretty tea towel, etc… Keep your more generic toiletries hidden in baskets or under the counter. I “wallpapered” the back of the open shelves with origami paper and poster strips. It covered the stickers and shelf holes perfectly and added a light pattern. 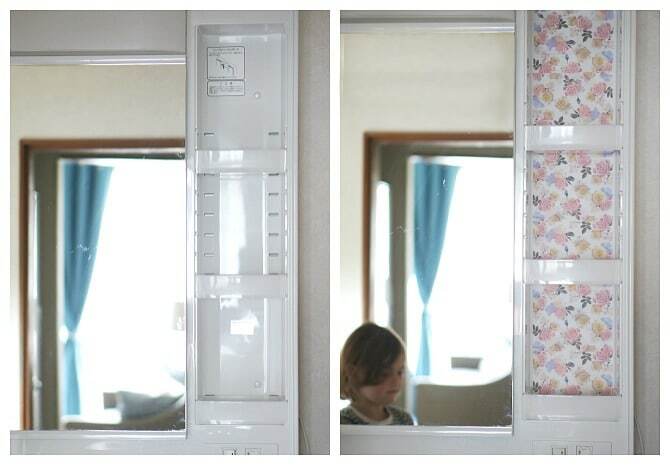 Consider using decals and stick on tiles. Using them sparingly and in the right place can add aesthetic appeal without looking too cheesy. Promise! They are also great for adding a pattern to your wall as “faux wallpaper”. If you walls are plain tile, try adding a few decorative peel and stick tiles to spice it up. It can be hard to decorate rentals when you move around often and can easily get expensive. Ninety percent of my “new” decor comes from the dollar store or from another room. 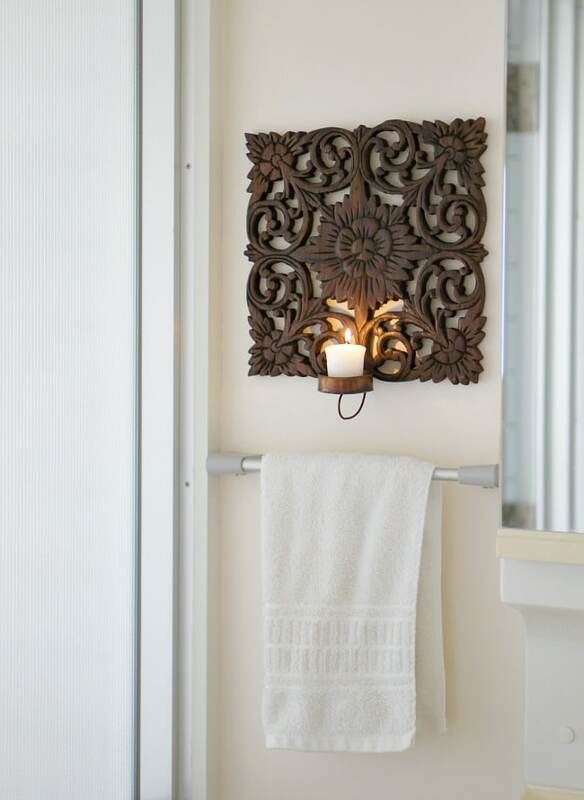 For more ideas, check out frugal decorating ideas for the bathroom. 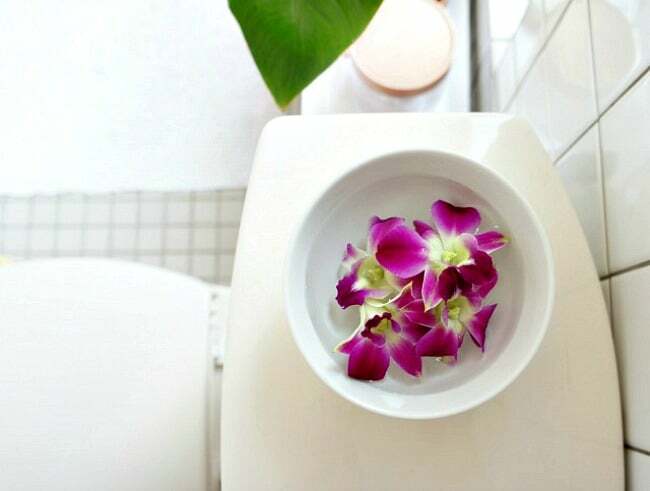 With just a few well placed pretty items, creative storage, and fun textiles and textures, you can make your rental bathroom feel stylish and guest ready! Hi Kathy! 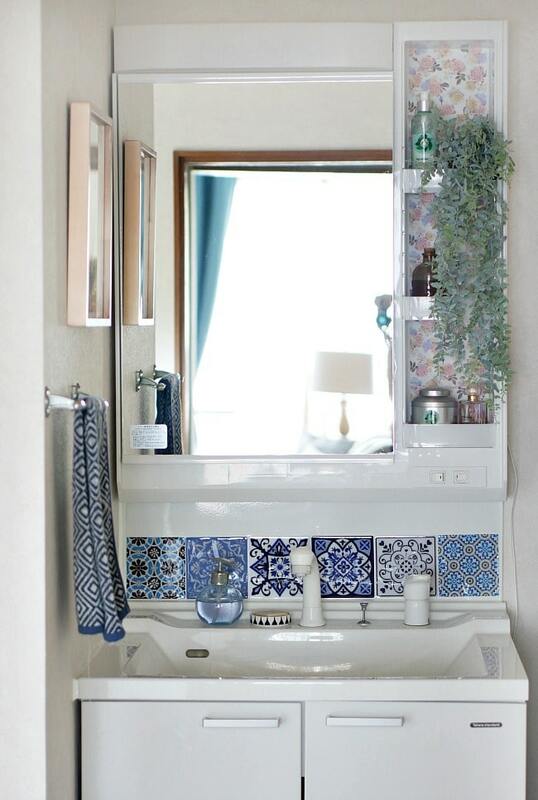 What a pretty bathroom and love all your ideas. I did notice you have a typo (I think, LOL). You have pretty soups and think you meant to say soaps. Keep up the great blogging!